So good I could eat it every day! Ever have one of those days where your stress level is shooting super high, anxiety is setting in swiftly, and it’s hard to get re-grounded? If it’s any solace, you’re not alone. I have ‘em all the time! I have a whole bunch of mindfulness and self-management techniques I’ve learned from others and have made up on my own to help me calm my nerves and center myself. I journal, I practice my breathing, I go for a run….But one trick that’s not in the books is this terrific toast. I love it. I feel better every time I eat it. 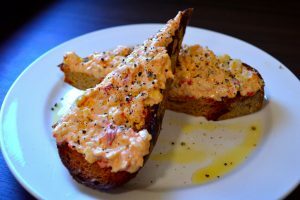 And if you’re one of the ever-increasing number of folks around Ann Arbor who have fallen in love with our pimento cheese, it might work for you, too. It starts with the toast: one thick slice of wonderful Roadhouse bread (one of my favorites from the Bakehouse). I’ve written about it at length elsewhere, but at the moment, let me just say it’s a marvelous traditional American bread. In the context of American culinary history, this bread was in nearly every New England cookbook from the colonial era. It’s a mix of rye, wheat, and corn, very slightly sweetened with a bit of molasses. When you toast it (or double-bake it like we do at the Roadhouse for table service, or at the Deli for sandwiches), man, it really brings out the flavors. I love it! I can—and do—eat it on its own all the time. What takes that into the “comfort zone” so compellingly is the rich, softly spicy, lively, kind-of-addictive flavor of our pimento cheese. Despite being northerners, we make really, really good pimento cheese. Southerner after southerner sings its praises. The latest was a chef from New Orleans—it got an eyebrow raise out of her, and she reached back to refill her plate more than once! We finish the toast with a drizzle of extra virgin olive oil and a nice sprinkle of the Zingerman’s 5-Star Black Pepper Blend. Order up, sit down, wait a few minutes, and then eat it while it’s hot. I always, always leave the experience less stressed, calmer, and better prepared to face the world!